Nissan Leaf – 25 Grand! The official news today is that the Nissan Leaf is going to cost just over $25,000, once the U.S. federal tax credit of $7,500 is figured in. Wow! It’s actually in the range of a “normal car”! If you already got on the “interest” list with Nissan, you will be able to get on the reservation list on April 20th, with firm orders in August, and cars rolling out in SOME parts of the country in December. In the past, when “select markets” were mentioned with EV’s, it has usually meant California, Arizona, Florida, and a few other flat, warm states. Since Nissan USA is based in Tennessee, I would assume that state would be one of the first to get the Leaf as well. 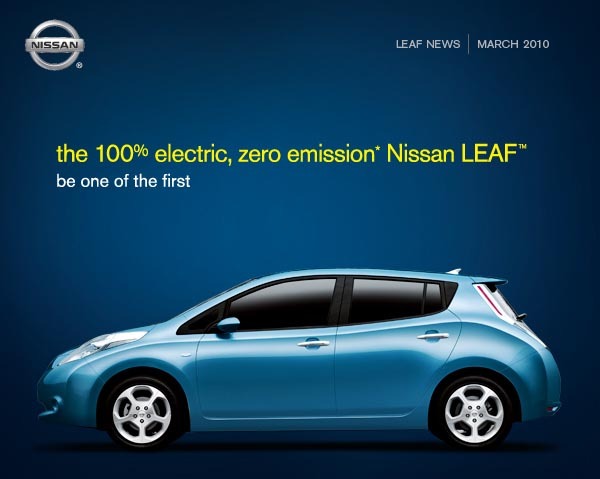 Besides outright purchase, the Leaf will also be available on lease for $2000 down and $349 a month for 36 months. So what does all this really mean? It means the Leaf is real. An honest to goodness ACTUAL car that runs on electricity instead of gasoline. This one is going to be a game changer. While other vehicles are coming soon to market – the Chevy Volt, Toyota Plug-In Prius, Ford Focus Electric and Connect Electric – I really think that the Leaf is going to be the first we will see on the roads, and the first “real” electric car the average American gets to see. As much as I love the Sebring-Vanguard Citicar, it really isn’t much more than a glorified golf cart. The Leaf is the right car for right now. Here’s hoping it becomes the Model T of the next wave of automobiles. PS: If you were thinking about buying a Tesla Roadster, why not instead buy a Leaf, and one each for three friends?! Next post: Why A Chevy Volt ISN’T for him.